In an ongoing effort to take action on environmental and social responsibility, we are proud to announce that we have recently teamed up with charity organisation, Project Pressure and artist, Noémie Goudal to produce an installation in the Uri mountain range, part of the Swiss Alps. 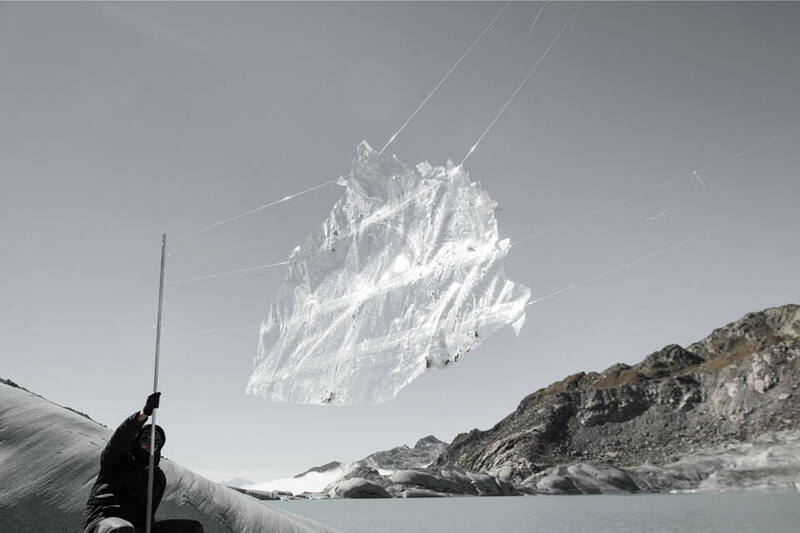 Project Pressure was instigated by Klaus Thymann in 2008, and is now a charity dedicated to creating the world’s first open source glacier archive. 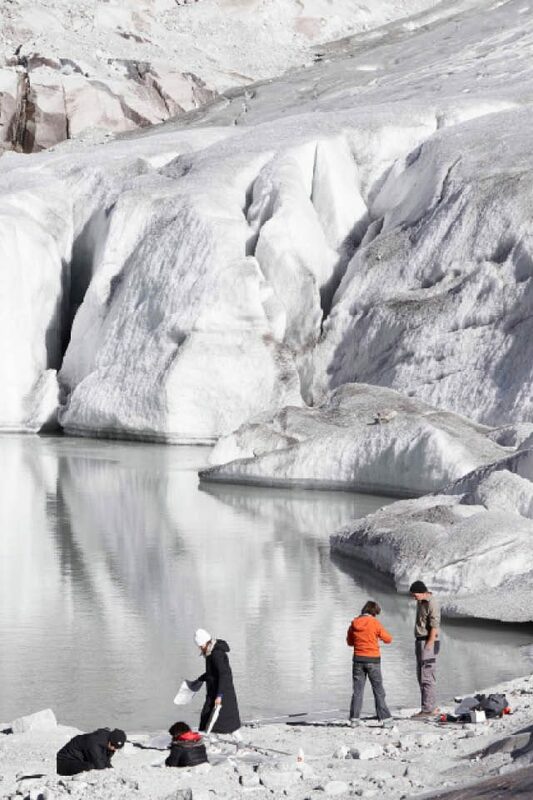 By documenting and publishing the world’s receding glaciers, the project has generated a lot of interest from scientific organisations, with NASA on board supplying satellite images for pointing out the world’s glaciers. 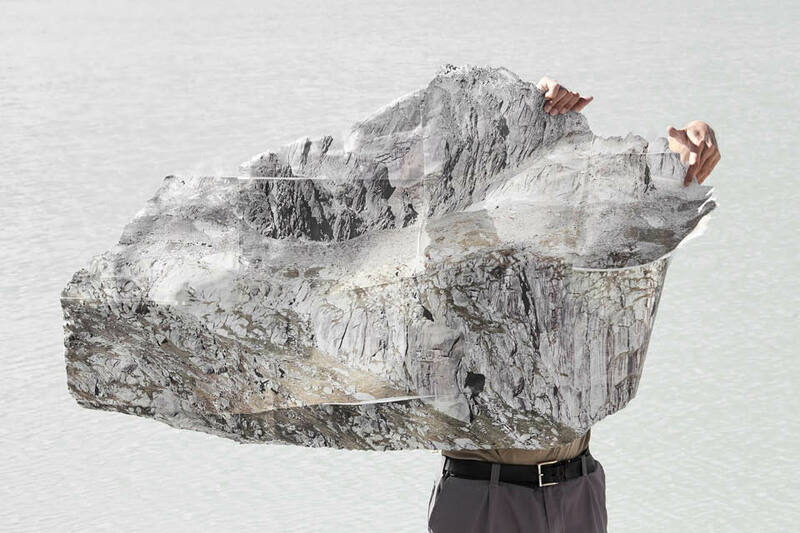 Two years ago Noémie Goudal and Klaus Thymann started initiating an installation in landscape surroundings. The idea behind the installation was to reflect Project Pressure’s mission to highlight how climate change is affecting landscapes in Europe and the rest of the world. 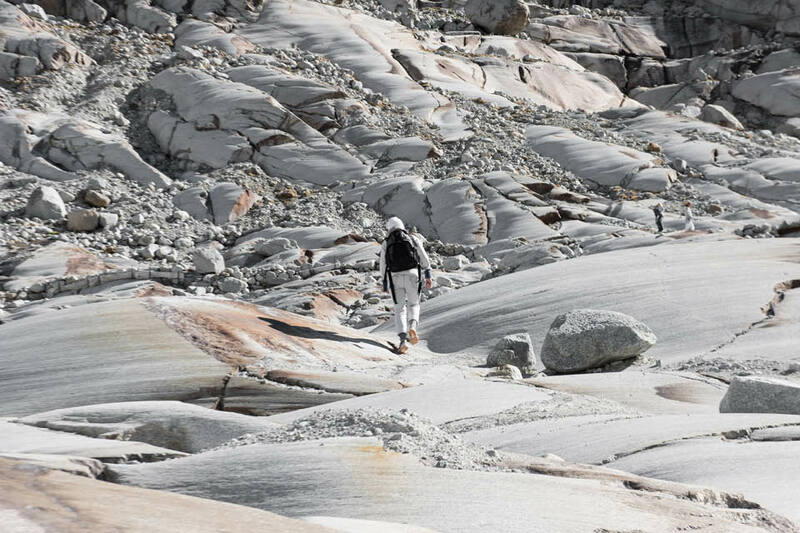 In the Swiss Alps, Noémie found the ideal glacier for her installation. “The purity of the air and sky, the very blue lake and colour of the ice all coincide to create a new experience”. Constructing an installation in a surrounding like this, turned out to be an important influence of ideas and the concept behind for Noémie. 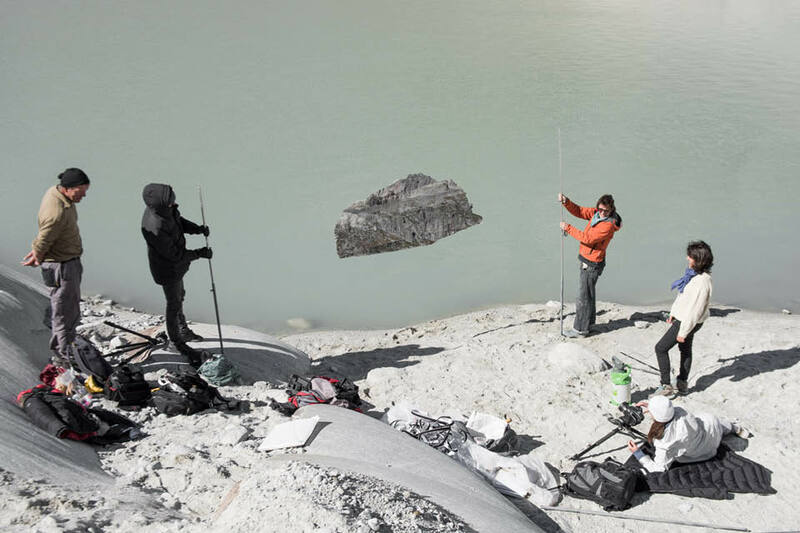 In mid-October 2016 she travelled to the Rhône Glacier with a volunteer production team to produce the installation. Landscape is the main area of Noémie Goudal’s installations, particularly the space between artificiality and natural. Her work has parallels between the stratums of an image versus the landscape. “Mountain landscapes of snow, rocks and ice melting reveal a new layer that eventually provides a visual comparison”, she says. Having ecological issues about sustainability in mind, the installation is the result of a challenge to find all possibilities when looking at a natural landscape. “The idea behind the installation questions how much you can use the landscape, then expect it to remain the same. If you damage a layer can it remain the same, will it rebuild?”, explains Noémie on how to take action on climate changes. After Noémie’s recce, her ideas for the installation developed as the logistical possibilities opened up. “My thoughts expanded, as the landscape began opening up”. The glacier run off has made a lake, which leads to an immense waterfall at the glacier mouth. 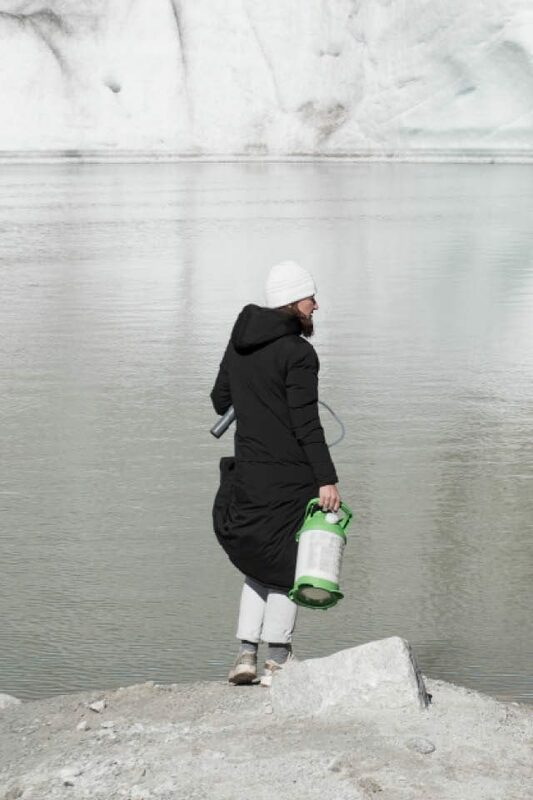 Her interest for the lake being part of the installation increased, as it depicted the transformation from solid to fluid in a way she had never experienced before. “With the noise of the glacier cracking being quite loud, it is a reminder that you’re working on a moving landscape. It is not a fixed installation and the work records the movement of a landscape that looks still but is actually moving”, explains Noémie on working with a moving landscape. The artwork in particular is a photo of Glacier du Rhône itself. The paper used in the installation is printed on biodegradable, ecologically-safe paper that changes from being a normal sheet, a solid thing, to a white paste. The paper disintegrates in water and as the artwork dissolves, eventually the artificial landscape can be seen against its natural form. Noémie points out that it was important for both her and the team to use materials that don’t damage the landscape. “Over a short period, the paper falls off in layers, if not only links back to the earlier point of the stratum of the landscape, it also relates to a real timeline to do with climate change affects”. The images below showcase the process behind the making of the installation.